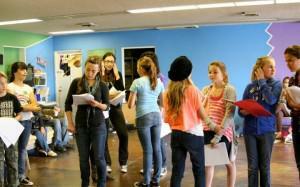 CPP's Theatre Club is an ongoing workshop program that runs throughout the school year. Participants learn and practice skills related to Musical Theatre (acting, singing, light choreography, and staging) through instruction, theatre games, exercises and activities designed to teach while having fun. Each student will be able to determine his or her own are of specific focus (e.g., more acting, more singing, equal, etc.). Topics include warm up techniques, voice, breathing, monologues and scene work, pantomime, basic choreography, performance singing, vignette recreation, timing, movement, musical character development and much more. At approximately 10 week intervals, the participants take part in a Showcase Performance that highlights the material each has worked on in the preceding weeks. In addition to the public Showcase Performance, participants will have the option to perform in additional public shows at senior facilities! (Occasionally the Portola Center is closed for Monday holidays - these usually coincide with school holidays. Our such days, class will be moved to CPP's Palm Springs facility. DURATION: Ongoing weekly with each session lasting approximately 2 hours. SCHEDULES: Monday from 3:45 p.m. to 5:45 p.m.* Showcase day/time set separately for each session. SEE CPP GENERAL CALENDAR link at left for all program schedules (subject to change). Dates in Palm Springs are scheduled from 4:00 p.m. to 6:00 p.m. to allow for additional travel time. Showcase performance days are from 4:00 p.m. to 6:00 p.m. for final dress rehearsals with an hour dinner break and public performance at 7:00 p.m. There will be a nominal charge of $5 per seat for attendance at the Showcase Performances. Family and friends are encouraged to attend and participants are expected to pre-sell a minimum of 3 tickets to the performance. CLASS SIZE MINIMUM AND MAXIMUM: A minimum of 10 and a maximum of 20 participants is desired. PARTICIPATION FEE: Our fee structure for this program is $35.00 per month (with a minimum commitment of 3 months (a nominal surcharge is added to pay by credit card through PayPal)). All partial payment arrangements must be WITH PRIOR FORMAL ARRANGEMENT ONLY. A month is considered an average of four sessions; some months may be more, some may be less. Absences on the part of the participant will not warrant a reduction in fee. CLASSES ONGOING IN PALM DESERT! JOIN NOW!